If there's one cover I feel gets overlooked more than any when it comes to listing the great stunners of all time, it is John Romita Sr's arresting image to Amazing Spider-Man #39. A hero unmasked by his arch-rival is as common as pumpkin today, but back then it was unheard of - lighting this fuse was pretty much a Marvel first! 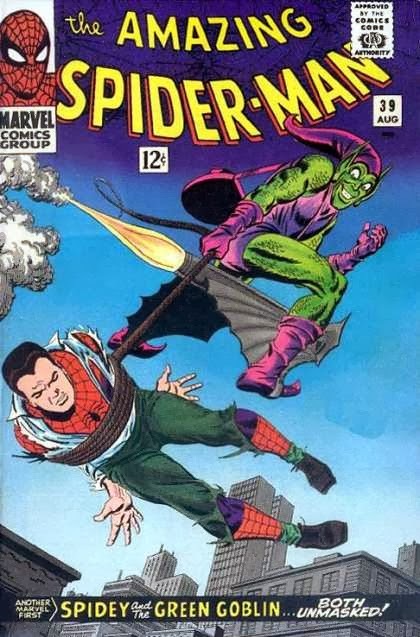 The sight of an unmasked Peter Parker being towed behind the Green Goblin's glider, across the city, grabbed me as a fan and to this day hasn't let go. When The King of Thessaly approached a few of us comic fans to do a new sketch and unleash them all on the same day, as a website crossover of sorts, I took the opportunity to homage the fanboy love I have for John's remarkable work and draw my first ever Green Goblin at the same time. Since taking this photo, I've added the classic logo in, and about to start on the colour - because lets face it, no pumpkin bomb should ever stay black and white! Goblin Gliders are a lot harder to draw than I thought, especially getting Norman to look like he's squatting on the thing too. 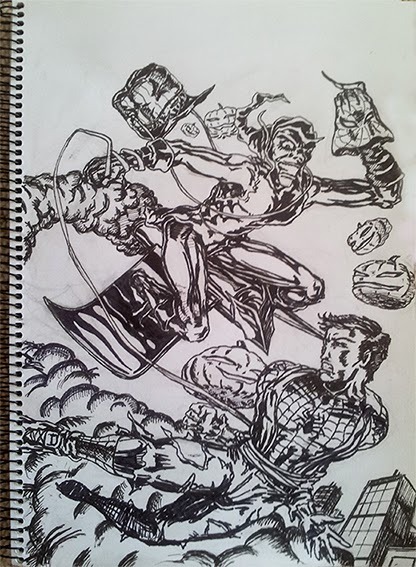 My first sketch looked too much like 'Osborn does a poo at 15,000ft' so that was my biggest challenge. I wanted to add the mask to the goblin's hand to further clarify what has happened, and have him come back round on a Peter that still looks like he has plenty of fight in him, in that true Spidey 'never give up' kinda style. Pumpkin Bombs are some of the coolest visuals in comics, so i used them to circle the action - and yeah, homage done! For the other sweet, sweet sketches in the crossover, click here to see King's art, here for Dave's or here for Omega's styles. Awesome websites all! two thumbs up for certain mate! i just wasn't feeling creative enough in the past week to come up with anything but this homage idea was a good one. it kinda allows you to be creative in a different way that doesn't require you to come up with something brand new but put a visually interesting twist on some previous art. i should have thought of something like this. Loving it Dan, L-O-V-I-N-G It! Can't wait to see the final finished product. Circle the action you did mate! Petey is in some trouble but we get creative goodness at it's best. Can't wait for the color. Thanks guys! I did this and a Bloodshot piece for Valiant's #fanartfriday they run on their Facebook page, so I've never drawn two detailed pieces at the same time, but yeah I like how it came off! Dan, speaking of homage art check out what i added to today's posting on the Rom blog. Excellent job! Turned out great! -With the mask in his hand, noice addition. Goblin's got that arch in his back too, son! Big pimpin'... Love the pumpkin-bombs, good choice. Good inks, too. AND you're gonna colour it? Damn! What are you gonna use? Hey, nice artwork indeed, very well realised. Thanks Karl and King - glad you both liked it! Could've easily drawn pumpkin bombs all day. The artists on Spider-Man must really curse any editor who makes them draw anything but!